Last week’s shock heatwave notwithstanding, it looks like autumn is here in earnest, so it’s high time we took another road-trip to see how the city’s coping with the change in season. You may want to add waterproof/warm layers to the usual checklist items. We’ll start off along the same route as our first trip. It’s still unseasonably warm, but there’s definitely more of a nip in the air than there was last week and the evenings are drawing in. Crunching over cornflake-like leaves, we pass cosy-looking kitchens on Camden Park Road, the warm light and delicious smells emanating from them making Lambeth Bridge seem a long way away. Disembark here for the Amy Winehouse shrine in Camden Square (not really my thing, so I’ll keep the camper van going, if it’s all right with you). 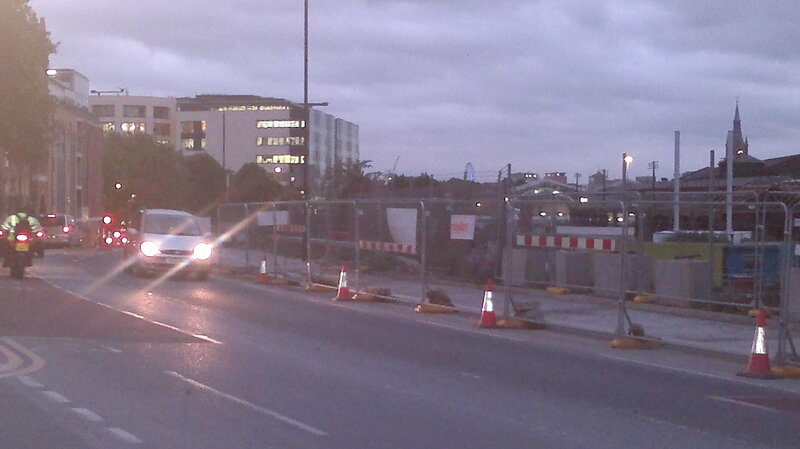 The new developments on York Way are really shooting up (the signs promise ’20 new streets, 10 new squares’), closing part of the pavement and nearly obscuring our reassuring glimpse of the BT Tower. But look over there – the London Eye, even closer to our final destination! Passing over the canal, a flock of birds keeps up a raucous dusk chorus as the sun finally disappears. Time to put on the headlights! There actually seem to be more people milling about on the streets than usual, and something of a party atmosphere in the air. We’ll have to swerve here to avoid that group of young dancers practising their moves in the middle of the street, all clad in matching leggings and UGG boots. We’ll avoid the crowds outside the station this time, instead looping over the ends of Pentonville and Gray’s Inn Roads. We’ll scoot down the little alley alongside the Camden Centre to get onto Tonbridge, then Hastings, then Judd Streets, following the same route (more or less) as our first trip. Taking a left off Guilford Street and into Queen’s Square, we pass the legendary Great Ormond Street Hospital again. Crossing the square, we’ll take Old Gloucester Street past the fantastically atmospheric October Gallery and onto Theobald’s Road. We (well, I) have an errand to run in Covent Garden market, so from here we’ll take a right onto Great Queen Street, follow it all the way along and across Drury Lane (looking out for the Muffin Man, of course), past the statue of a ballerina in Broad Court, down Long Acre and into the bustling theatre district around the market. 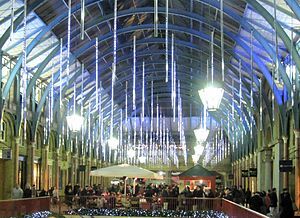 Alight here for shops, bars, cafés, clubs, street entertainers, stalls and restaurants. Our errand accomplished, we’ll forge a path through the crowds milling outside restaurants and queuing to see The Lion King in the Lyceum, across the Strand and onto Waterloo Bridge. Disembark here for Somerset House and other riverside delights. 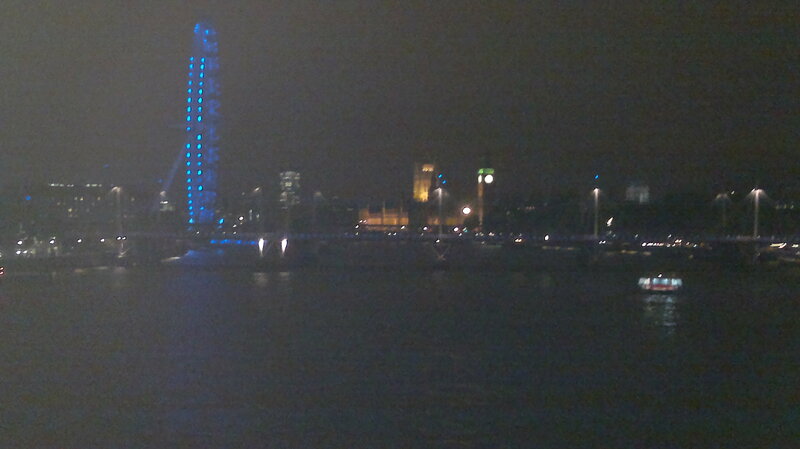 The view from Waterloo Bridge is possibly my favourite in London, even (or perhaps especially) in the dark. See? Hmm, well maybe my phone camera doesn’t really do it justice, but you get the idea. It’s quite blustery here, but say what you like about pollution levels in London, it still feels like fresh air after a day cooped up in the office. As we near the south side of the bridge, look right to admire Pipilotti Rist’s knicker lanterns outside the Hayward Gallery and the remains of restaurant Dishoom’s recreation of Mumbai’s Chowpatty Beach. Alight here for the many attractions of the South Bank. Having travelled through the underpass, we’ll emerge by the main entrance to Waterloo station, feeling very, very grateful that we don’t have deal with South West Trains today (if you are alighting here to connect with an overland train, you have my deepest sympathies). We’ll pass the multistorey bike rack and the taxi rank and marvel at the sign prohibiting the movement of barrows across the station’s booking hall floor. Crossing over Station Approach Road, we’ll pass onto Lower Marsh. I love this local street – it has everything you could possibly need; Thai greasy spoons, a traditional English greasy spoon, a swanky deli, a Cuban bar/restaurant, funky ScooterCaffe (where you can sip super-strength coffees, beers or wine with Lambeth’s arty crowd) and the most wonderful vintage/retro shop, Radio Days. We’ll cross the main road and go under the railway bridge, listening to the screech of trains along the tracks. In daylight we could take a short cut through Archbishop’s Park, (in which I do believe just about every sport is represented in a tiny space) but since it’s dark we’ll have to content ourselves with listening to the sound boxes of William Blake’s poetry between Carlisle Lane and Hercules road. Emerging at the top of Hercules Road, it’s only a short hop to the right (moving briskly past Finecrown Patisserie to avoid being tormented by the smells of fresh croissants) to Lambeth Palace. Now this is moving beyond my remit as your driver (is it a bad time to mention I don’t have a licence and have never driven a non-virtual vehicle? )/tour guide, but I heartily recommend spicy roast vegetable risotto and hot ports when you get home, in keeping with the autumnal feel and as a reward for our long walk.